The D.O.T.S. 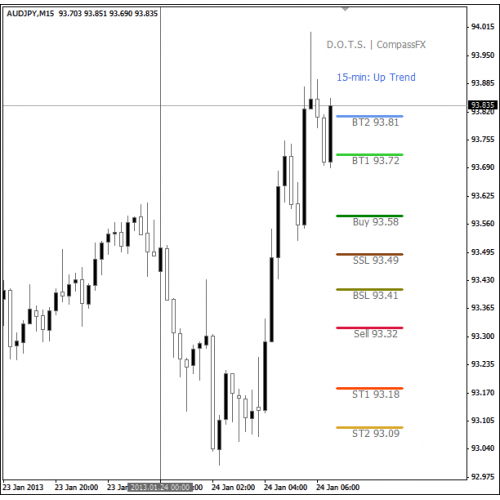 (Daily Open Trading System) Method Indicator is a stand-alone trading model built into one indicator that identifies Entries, Exits, and Targets at the Open of the Day. D.O.T.S. 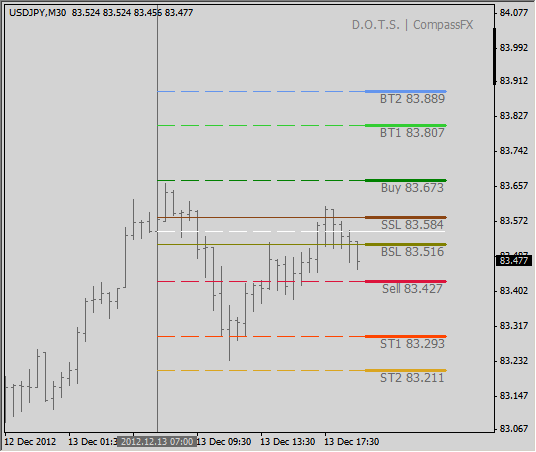 is a price based indicator that calculates potential market price levels based on daily and historical market movement. The beauty of the D.O.T.S. 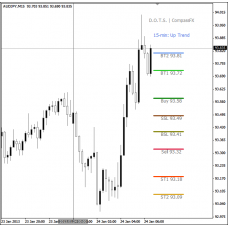 Method indicator is its simplicity that most any trader, regardless of level of experience, trading style or trading system, can use in real-time at a glance. Stand-Alone one indicator trading model. Automatically updates at the Daily Open or Selectable Session Open. 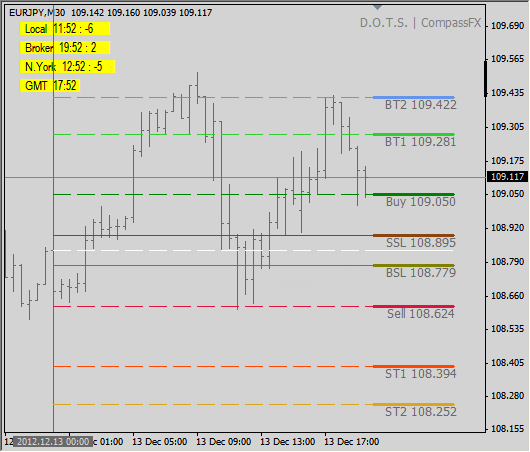 Identifies Buy Entry, two Buy Targets, and Buy Stop Loss levels. 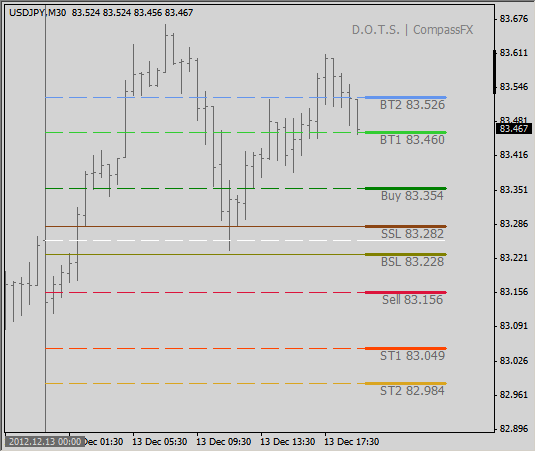 Identifies Sell Entry, two Sell Targets, and Sell Stop Loss levels. 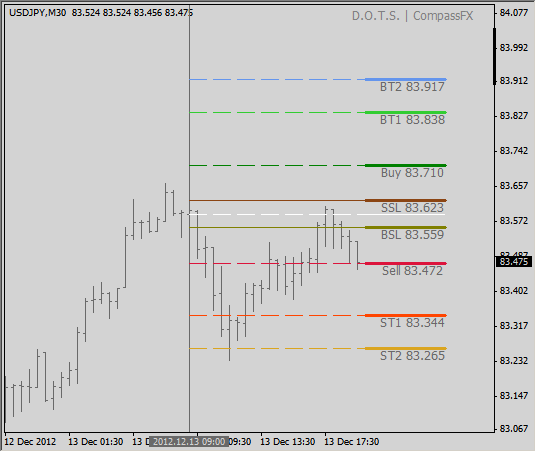 Displays in the right margin so not to interfere with other trading systems. Works with ANY MetaTrader 4.0 platform and template! Selectable Daily Open: Australia, Tokyo, Midnight NY, Europe, London, and U.S. Display Trend Direction: Up, Down, or Flat. Look back feature shows DOTS Levels over a number of days. Local time, Broker time, New York time, & GMT. The Daily Open begins at 5:00 PM Eastern. The Daily Open begins at 12:00 AM Midnight Eastern. The Daily Open begins at 3:00 AM Eastern. The Daily Open begins at 8:00 AM Eastern. View multiple days of DOTS Levels. Up to 22 days of DOTS levels can be shown. 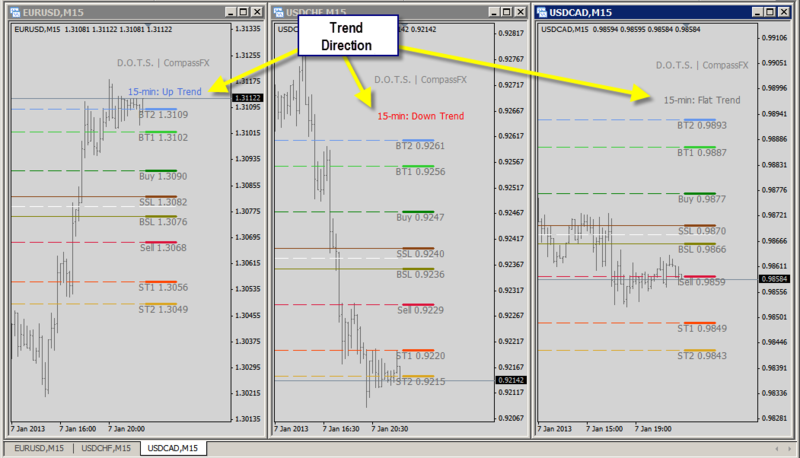 Show Trend Direction: Up, Down, or Flat Trend.